That’s right boys and girls it’s time for another contest. This time it’s the in NFL with the play-offs. What are we playing for? A $25.00 gift card from Red Lobster, Olive Garden or Chili’s. If you win you pick! Here’s how it works. You have to sign-up through the forum by simply posting your picks in the NFL Play-Offs Contest thread. You will receive 10 points for each correct pick in the “Wild Card” round this weekend, 20 points for correct points in the “divisional play-off” round next weekend, 30 points for correctly picking the conference championship winner and 40 points for picking the correct Super Bowl winner. 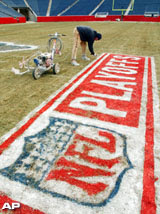 Picks will need to be made each week of the play-offs and must be submitted by kick-off of the first game of each round. No Exceptions! In addition to the points from your weekly picks there are also two Wild Card picks. First, you must state who you believe the Super Bowl winner will be when you make your first round picks. You will receive an additional 10 points each week if your Super Bowl winner survives that round up to and after the Super Bowl. Secondly the NFL teams are seeded 1-6 in each conference. You get to pick one team as your sleeper and will receive points equal to their seed for each week they advance to the next round. For example, the New York Jets are the No. 5 seed in the AFC. If they were your sleeper pick then you would receive an additional 5 points for each week they advanced in the play-offs. Simple enough? Your round one picks should look something like this. You have to be a registered user at the forum to enter the contest but it’s quick easy and free. Head on over and join the contest! You Do Realize It Was a Horse, Right?